Open Banking is in motion — launched on the 13th of January 2018, it means the nine largest banks in the UK need to follow new regulations introduced by the Competition and Markets Authority (CMA). A report by the CMA showed that the UK’s major banks weren’t having to compete hard enough while challenger banks, fintechs and other third-party providers struggled to enter the market. Open Banking is designed to change all that. Customers can now choose to give third parties access to the financial data held by their bank, paving the way for a small business banking revolution. 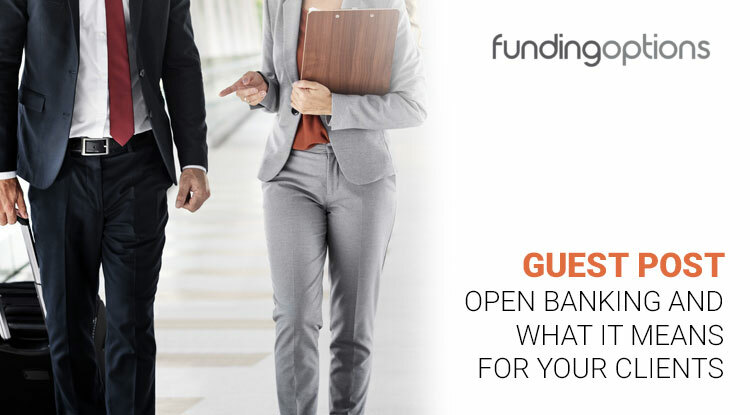 But what exactly does Open Banking mean for accountants and their business clients? Here’s what you need to know. The fundamental idea behind Open Banking is that the financial data in your bank account is your data, and it should also be your choice how to use it, and who is allowed to access it. It works using application programming interfaces (APIs), a proven and secure way of moving information from one piece of software to another. There is a standard API for Open Banking, which is important because it means third party providers can develop products using this data in the knowledge that whatever they build will be compatible with all the major banks. To boost Open Banking, the global innovation foundation Nesta started the Open Up Challenge, offering a £5 million prize fund to fintech companies, challenger banks, consumer groups, and third party providers. My firm Funding Options is one of ten finalists developing new apps, tools, and services that’ll help small businesses use this financial data to their benefit. We expect that Open Banking will make the process of finding the right business loan quicker and easier because of reduced administration — even the most technology-focused lenders are forced to manually review bank statements, and Open Banking could automate away this friction point. Open Banking has the potential to remove many other administrative burdens that weigh small companies down. For instance, your business clients won’t need so many diverse systems to run their business any more, and it will be possible to combine banking and accounting services into one system. Additionally, accountants and bookkeepers using Open Banking software will be able to access their clients’ financial data instantly, which will make the process much faster and easier. Reconciliation can be a struggle in accountancy, and waiting for documents to be sent over or data to be entered manually can cause low efficiency and frustration. Instant access will allow accountants and bookkeepers to do their job more efficiently, which will also be a benefit for their business clients. In short, Open Banking is encouraging third party providers and developers to create online services that can help the 5 million small and medium businesses in the UK to tackle real problems they’re facing in the day-to-day running of their business. Whether it’s expense tracking, cash flow prediction, or automated accounting, business owners will soon be able to do it all with just one or two service providers online. Whatever service they choose, instant access via API will make the process more efficient. Clients will have to give authorisation by logging in with their online banking account details. The third party never gets the login credentials like username and password — instead, Open Banking uses the same industry-standard method that you may have seen as “Login with Facebook”. In general, administrative processes will become more automated, more accessible, and more transparent for both service providers and companies. It’s also very likely that more ideas will be developed now that there’s a standard API for accessing the data. Open Banking is a first step to give firms more control over their financial data. By giving approved third parties access to this financial data, they can offer straightforward options to understand it, to benefit from it, and to tackle financial issues faster and easier. Furthermore, Open Banking could make everyday work a lot easier for accountants and bookkeepers. It remains to be seen exactly how Open Banking will turn out in the long run, but fundamentally we’re moving from a world where the bank controls the data they hold on customers to one where customers get to control it — which could lead to innovative new services in the next few years. The world of finance is changing fast, and so too is the world of accounting. Subscribe to the Receipt Bank blog to stay one step ahead – simply fill in the form at the top of this page and click 'Subscribe Now'.